2005 stunk. I mean, like any year, it had some moments, but take any year in which the most musical, magical, and European of America’s cities is damn near erased (not to mention the utter devastation that went well beyond New Orleans.) That’s it. Just take that year and you two just depart and don’t let me see either of you around here again. For that stupid hurricane alone, 2005 stunk. But wait, that’s not all! Let’s not forget about the worst weather in winter and spring ever, and the three feet of snow we got on one day, and -oh yeah! -what about those stupid tornadoes (tornadoes?!? -or whatever they were) that tore all the damn trees out of the ground last week. Look, if it’s any help at all, I’d just like to say that I AM KEEPING TRACK OF ALL THIS AND THE WEATHER THIS YEAR HAS BEEN WAY OVER THE LINE! Period! You can’t tell me this is normal. Plus, what’s this with all my friends getting sick? Cut it out! I mean, that’s just stupid! You can’t kill them; who will I borrow from? The lack of work, that’s been annoying. Not so much the lack of the work as the scarcity of the money resulting from the work. The scarcity of the money has consistently been too LARGE, which has caused hardship in my HOUSEHOLD. Again, I am KEEPING TRACK, and if I were You, I’d be a lot nicer to me. 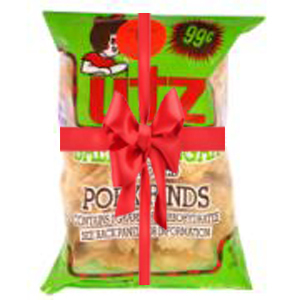 The only good and pure thing that happened in 2005 was that the Eastham Superette expanded their Utz section. For those of you who are unblemished by practical knowledge of any kind, let me explain that Utz is the finest manufacturer of potato chips in the region, and that they have gotten better and better, proving their supremacy once and for all this year with the introduction of their Carolina Barbecue line. This is the kind of chip that will make you quit work for good, the kind that makes normal food superfluous. Their pork rinds -especially the salt and vinegar ones -are also justly celebrated. Without Utz this year, I definitely would’ve slit my throat. They were truly the only thing that kept me out of the hospital. Oh yeah, and singer-songwriter Kami Lyle, who, with her husband (and bass player extraodinaire), Joey Spampinato and seven-sting guitar master Fred Fried, have been wonderful contributors to the local scene since Kami and Joey’s arrival from Nashville last winter. Kami is an ingratiating performer with a terrific sense of the absurd, and if you haven’t checked her out yet… well, that’s your problem. The New Pornographers put out yet another cool album in ’05, as did Madeleine Peyroux; as did Of Montreal, which is nothing unusual -the surprising part is that they’re actually starting to sell (man, it’s about time!) Sufjam Stevens , the Animal Collective, and Joanna Newsome all surfaced to good effect, as did Petra Haden, who followed a charming, solo, acapella version of “The Who Sell Out” with a collaboration with Bill Frisell. England’s Geraint Watkins made a fine CD called “Dial ‘W’ For Watkins”(YepRoc) with an amazing, Louis Prima-style version of the Beach Boys’ “Heroes and Villains”; and Paul McCartney’s “Chaos and Creation in the Backyard” (Capitol) had some of his finest melodies in years, unfortunately accompanying some of his worst lyrics. Worst local musical trend of ’05: the lack of gigs and new material by my favorite band, NRBQ, who we’d kind of gotten used to having around; one can only hope this problem will be corrected in ’06. All in all, kind of a dumb, excruciating kind of year, leaving 2006 a real easy act to follow. And that’s not just my opinion, either -everyone thinks so. This entry was tagged Animal Collective, Arrested Development, Bill Frisell, Bill Nighy, Crash, Deadwood, dogs, Dot the I's, Eastham Superette, Fat Actress, Fred Fried, Geraint Watkins, Gip Hoppe, Joan Allen, Joanna Newsome, Joey Spampinato, John Coltrane, Kami Lyle, Kelp Manor, Kevin Costner, Kirsty Alley, Madeleine Peyroux, Martin Short, Motorcycle Diaries, Mrs Kelp, My Architect, New Pornographers, Of Montreal, Off the Map, Paul McCartney, Petra Haden, Sea Dog, Spun, Sufjam Stevens, The Life Aquatic With Steve Zissou, The Saddest Music in the World, The Upside of Anger, Thelonious Monk, Two Brothers and a Bride, Utz, weather, Year End Wrapup. Bookmark the permalink.